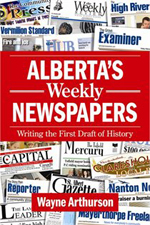 Weekly Newspapers in Alberta: Writing the First Draft of History by Wayne Arthurson and published by Folklore Press (2012) is a chronicle of the first newspaper publishers in Alberta. 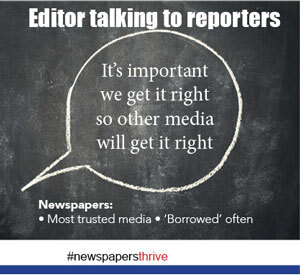 It opens with Frank Oliver, and the publication of the Edmonton Bulletin on December 6, 1880 and ends with a chapter on the St. Albert Gazette, voted the Best Community Newspaper in Canada in 2012 by the Canadian Community Newspaper Association. The book places community newspapers at the centre of history in the development of cities, towns and communities in Alberta. Through hands on experience while working at the Olds Gazette and the Didsbury Review and through archival research and oral histories with the sons, daughters and friends of newspaper pioneers, Wayne Arthurson weaves an interesting story of Alberta’s history from the first newspaper published in Alberta to the newspapers of the present day (mediamag.ca). $10 each (plus tax) for ten or more, or $15 each for less than ten.